China is making great efforts to transform a traditional investment-led economy to a more sustainable model of a technology-driven and market-oriented economy. Since the beginning of the new millennium, China state government has created the framework of seven emerging industries that are intended to be important in order to accomplish this goal. China government is hoping an industrial upgrade by establishing a quantitative target for the SEIs’ contribution on GDP. The SEIs are anticipated to account for 8% of GDP by 2015 and up to 15% of GDP by 2020. As usual, SEIs policy has followed the similar pattern to other technology development policies in China, where central government formulates the general guidance and principles while local government bears the responsibility of detail implantation, and both central government and local government will allocate corresponding fund support. Under the policy direction, a number of government agencies have been engaged in the program. The program’s implementation is another crucial dimension that takes time because of the repeated debates and the exploration by horizontal coordination among different government key agencies and hierarchy vertical communication. An inter-ministerial coordination group is required to set up upon the 12th Five Year Plan on the Development of the Strategic Emerging Industries. National Development and Reform Commission (NDRC) is nominated to take the lead of the coordination group with other group members playing a role of analyzing, overseeing and supporting the implementation. 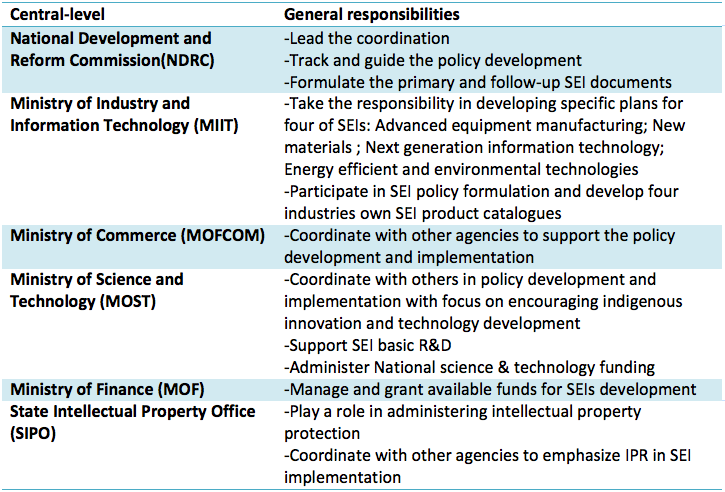 The following diagram is a briefing on china government agencies involved in SEIs. From the government side, financial incentives will be a primary measure to motivate companies to conduct R&D and commercialize new technologies and products in SEI. The incentives include tax rebates and financial subsidies that considerably help company increase investment on SEI. Most SEI supporting fund will mainly come from local government and private enterprises as the interim measures for the administration of special funds for SEI that emphasizes a combination of funding from various funding sources. Local government will set up specific funding pool or utilize existing funding program to support SEI local development, and determine the allocation of the funds according to local SEI policies and industry demand. The industry transformation and economy reformation would definitely reshape the market and reshuffle the market players. There are concerns on discrimination against foreign-invested companies and products. Supporting policies usually requires the indigenous intellectual property rights with the goal to cultivate innovation and technology development, which would turn away foreign companies who are unwilling to import intellectual property. Another method is China government procurement that is viewed to be an important measure to promote certain technologies and brands. There are concerns that the procurement policy may favor Chinese companies in SEIs. Given the profound influence and complexity among different stakeholders, the best method of SEIs calls for testing and verification.